That’s the famous ending of Sholem Aleichem’s 1904 story “Hodl,” about Tevye the Dairyman’s daughter who marries a communist and follows him into exile in Siberia. The story is a heartbreaking one, ending with a forced separation between a Russian-Jewish parent and child. But the agony buried within that final joke transcended literature after Sholem Aleichem’s death—when revolutionaries like Hodl’s husband actually succeeded in creating a new Russian regime that promised its Jews lives of integrity, seduced them into compliance, and ultimately ate some of the best of them alive. The Soviet-Jewish experience took the form of a psychological horror story, brimming with suspense, double-crossing, and twisted self-blame. Its greatest horror came in the undoing of the Jewish Antifascist Committee, a board of prominent Soviet-Jewish artists and intellectuals established by Joseph Stalin in 1942 to drum up financial support from Jews overseas for the Soviet war effort. Two of the more prominent names on the JAC’s roster were Solomon Mikhoels, the director of the Moscow State Yiddish Theater, and Benjamin Zuskin, the theater’s leading comic actor. After promoting these people to the skies during the war, Stalin decided these loyal Jewish communists were no longer useful and charged them all with treason. Mikhoels was murdered first, in a hit staged to look like a traffic accident. Nearly all the others, including Zuskin and several renowned Yiddish writers, were executed by firing squad on August 12, 1952. As for the defendants at the trial, it is not clear what they believed about the system they each served. Their lives darkly embodied the tragedy of Soviet Jewry. A combination of revolutionary commitment and naïve idealism had tied them to a system they could not renounce. Whatever doubts or misgivings they had, they kept to themselves, and served the Kremlin with the required enthusiasm. They were not dissidents. They were Jewish martyrs. They were also Soviet patriots. Stalin repaid their loyalty by destroying them. This is completely true and also completely unfair. The tragedy—even the term seems unjust, with its implied blaming of the victim—was not that these Soviet-Jewish artists and intellectuals sold their souls to the devil, though many clearly did. The tragedy, for which no one can be blamed but the relevant devil, was that integrity was never an option in the first place. Of the many varieties of anti-Semitism, or anti-Judaism, that have plagued the Jews over the centuries, two recurrent general patterns can be identified by the holidays that celebrate triumphs over them: Purim and Hanukkah. In the Purim version, exemplified by the Persian genocidal decrees in the biblical book of Esther, as well as by more recent ideologies like Nazism and today’s many versions of radical Islam, the regime’s goal is unambiguous: Kill all the Jews. In the Hanukkah version, as in the 2nd-century B.C.E. Hellenized Seleucid regime that criminalized all expressions of Judaism, the goal is still to eliminate Jewish civilization. But in the Hanukkah version, this goal could theoretically be accomplished by simply destroying the civilization, while leaving the warm de-Judaized bodies of its former practitioners intact. For this reason, the Hanukkah version of anti-Semitism—whose appearances range from the Spanish Inquisition to the Soviet regime—often employs Jews as its agents. These “converted” Jews openly renounce whatever aspects of their Jewish identity are unacceptable to the relevant regime, proudly declare their loyalty to the ideology of the day, and loudly urge other Jews to follow them. These people are used as cover to demonstrate the good intentions of the regime—which of course isn’t anti-Semitic, but merely requires that its Jews publicly flush thousands of years of Jewish civilization down the toilet in exchange for the prize of not being treated like dirt or murdered. For a few years. Maybe. After many episodes of Purim-style anti-Semitism on the steppes, and especially after the Holocaust, it is perhaps not surprising that so many Soviet Jews fell into the trap of not recognizing Hanukkah-style anti-Semitism when it first became apparent or of actively serving as the regime’s willing agents. In the wake of indiscriminate massacres ranging from Khmelnitzky to Petliura to Babi Yar (the latter two in their living memory), these people may well have found a certain appeal in the prospect of not being murdered, regardless of the cost. For those artists who worked in Yiddish, the Soviet Union in its early years had the added attraction of apparently not treating them like dirt. In its quest to brainwash national minorities in the 1920s and 1930s, the regime offered unprecedented material support to Yiddish culture, paying for Yiddish-language schools, theaters, publishing houses, and more, to the extent that there were Yiddish literary critics who were actually salaried by the Soviet government. This support led the major Yiddish novelist Dovid Bergelson to publish his landmark 1926 article “Three Centers” about New York, Warsaw, and Moscow as centers of Yiddish-speaking culture, asking which city offered Yiddish writers the brightest prospects. Bergelson’s unequivocal answer was Moscow, a choice that resulted in his execution in 1952. If the goal here weren’t spelled out clearly enough, one can see the process even more vividly in the repertoire of the government-sponsored Moscow State Yiddish Theater, which could only present or adapt Yiddish plays that denounced traditional Judaism as backward, bourgeois, corrupt, or even more explicitly—as in the many productions involving ghosts and graveyard scenes—as literally dead. As its actors would be, soon enough. Zuskin Perelman, who now lives in Israel, was only 12 years old when her father was arrested. But her book—previously published in Russian in 2002, and in Hebrew in 2006, is newly available in English in a somewhat abridged form—is pain-stakingly researched in both Russian and Yiddish sources, and she grew up completely immersed in her father’s world. Her mother was also an actor in the Moscow State Yiddish Theater, and her family lived in the same building as Mikhoels, along with many other important Soviet-Jewish artists. In addition to seeing her parents perform countless times, she also witnessed the destruction of their world: She attended Mikhoels’s state funeral; witnessed the arrest of the Yiddish writer Der Nister, whose apartment was across the hall from hers; and was present when secret police ransacked her home in conjunction with her father’s arrest. We are accustomed by now to reading emotional memoirs of Holocaust survivors or victims written by their children, and, since the collapse of the Soviet Union, we are also accustomed to clinical reports of Soviet crimes extracted from archives opened in the past 20 years. ­It’s as close as we can get, anyway. Benjamin Zuskin’s own thoughts on the topic are only available from state interrogations extracted under unknown tortures. (One typical interrogation document from his three years in the notorious Lefortovo Prison announces that that day’s interrogation lasted four hours, but the transcript is only half a page long—leaving to the imagination how interrogator and interrogatee may have spent their time together. Suffice it to say that another JAC detainee didn’t make it through the trial alive.) His three years in Lefortovo began when he was arrested in 1949 in a hospital room, where he was being treated for chronic insomnia brought on by the murder of his boss and career-long acting partner Mikhoels; the secret police strapped him to a gurney and carted him to prison in his hospital gown while he was still sedated. But we’re getting ahead of ourselves. And for that one needs to return to the world of Sholem Aleichem, the author of Benjamin Zuskin’s first role on the Yiddish stage, in a play fittingly titled It’s a Lie! Benjamin Zuskin’s path to the Yiddish theater and later to the Soviet firing squad began in a shtetl comparable to those immortalized in Sholem Aleichem’s work, and part of this memoir’s beauty is the attention it lavishes on how the old world Zuskin came from animated his art. Zuskin, a religious child who was exposed to theater only through traveling Yiddish troupes and clowning relatives, experienced that world’s destruction: His native Lithuanian shtetl, Ponievezh, was among the many Jewish towns forcibly evacuated during the First World War, catapulting him and hundreds of thousands of other Jewish refugees into modernity. He landed in a secular secondary school in Penza, a Russian city with a Yiddish theater presence. In 1920, the Moscow State Yiddish Theater opened, and by 1921, Zuskin was starring alongside Mikhoels, the theater’s leading light. Zuskin specialized in playing comic figures like the Fool in King Lear—as his daughter puts it, characters who “are supposed to make you laugh, but they have an additional dimension, and they arouse poignant reflections about the cruelty of the world.” In an autobiographical essay included in the volume, Zuskin articulates this vividly. As he discusses his favorite roles, he explains that “my heart is captivated particularly by the image of the person who is derided and humiliated, but who loves life, even though he encounters obstacles placed before him through no fault of his own.” Unwittingly, Zuskin was pretending to be no one but himself. after a performance in Vienna, one theatergoer came backstage to tell the director that “the play had shaken him as something that went beyond all imagination.” The theatergoer was Sigmund Freud. In Zuskin Perelman’s telling, her father differed from his director, partner, and occasional rival Mikhoels in his complete disinterest in politics. Mikhoels was a public figure as well as a performer, and his leadership of the Jewish Antifascist Committee, while no more voluntary than any public act in a totalitarian state, was a role he played with gusto, traveling to America in 1943 and speaking to thousands of American Jews to raise money for the Red Army. Zuskin, on the other hand, was on the JAC roster, but seems to have continued playing the fool. His role in the JAC was comparable to a similar post he held on a Moscow city council, where his contribution was limited to playing chess in the back of the room during meetings. One morning—already after the murder of Mikhoels—I saw my father pacing the room and memorizing the words of Hotsmakh’s role. Suddenly, in a gesture revealing a hopeless anguish, Father actually threw himself at me, hugged me, pressed me to his heart, and together with me, continued to pace the room and to memorize the words of the role. That evening I saw the performance … “The doctors say that I need rest, air, and the sea . . . For what . . . without the theater?” [Hotsmakh asks], he winds the scarf around his neck—as though it were a noose. For my father, I think these words of Hotsmakh were like the motif of the role and—I think—of his own life. Describing the charges levied against Zuskin and his peers is a degrading exercise, for doing so makes it seem as though these charges are worth considering. They are not. It is at this point that Hanukkah anti-Semitism transformed, as it so easily can, into something closer to Purim anti-Semitism. Here this memoir offers us what thousands of pages of state archives can’t, describing the impending horror of the noose around one’s neck. Zuskin stopped sleeping, began receiving anonymous threats, and saw that he was being watched. No conversation was safe. When a visitor from Poland waited near Zuskin’s apartment building to give him a message from his older daughter Tamara (who was then living in Warsaw), Zuskin instructed the man to walk behind him while speaking to him and then to switch directions, so as to avoid notice. When the man asked Zuskin what he wanted to tell his daughter, Zuskin “approached the guest so closely that there was no space between them, and whispered in Yiddish, ‘Tell her that the ground is burning beneath my feet.’” His arrest under sedation in his hospital gown seems almost merciful by comparison. Yet there was no mercy in what followed and also no guilt. It is true that no one can know what Zuskin or any of the other defendants really believed about the Soviet system they served. It is also true—and far more devastating—that their beliefs were utterly irrelevant. Writing about Sholem Aleichem’s work, Zuskin once noted that “Comic and tragic, laughter and tears, these two opposites are woven together and they cannot be separated.” This idea of laughter-through-tears has become such a platitude in describing Yiddish culture that we accept it as though it were a feature of all humor, as though the comic and the tragic were always interwoven, as though it were normal. It isn’t, of course. But in the theater of Hanukkah-style anti-Semitism, where absurdity piles upon absurdity until even 63 years later we are still debating the degree to which these Jews deserved to be executed by firing squad, it is disturbingly consistent. is not tragic. It is heartbreaking. But perhaps we can instead talk about something more cheerful. Have you heard any news about the cholera in Odessa? It was doubly fitting that Ala Zuskin Perelman, visiting from her home in Israel, spoke earlier this month at the Center for Jewish History. 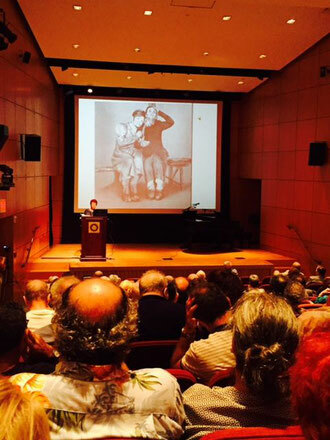 Her talk, co-sponsored by YIVO, was on her father, the famed Russian-Jewish actor Benjamin Zuskin, and launched the book she has written about his life and art, The Travels of Benjamin Zuskin (Syracuse University Press). First, her book and the sponsors of the event have similar aims; they do not wish to sentimentalize Yiddish culture, language or life. In Zuskin Perelman’s book and in the exhibits of the CJH and YIVO, there is in their treatment of Ashkenazi culture a seriousness of purpose that strips away the easy old jokes and stereotypes, and instead allows the subject to be seen as vital and influential. Second, August 11 was the anniversary of an event that lives in infamy, when Benjamin Zuskin, along with twelve other Jewish cultural luminaries, were murdered. as well as the art of the theater. Acting as an art, like the study of history, carries with it a pregnant tension. At once somehow both ephemeral and documented (if it weren’t it would be impossible to discuss, or in this case, write about), what the actor has created by the end of the evening is the same thing historical events produce: witnesses to an event that’s vanished. is very much alive in The Travels of Benjamin Zuskin. The biography regularly pauses to illustrate the absurd centrality that inanimate objects have on the abstract aspects of a person’s life. For instance, as part of his devotion to the small Jewish theater company to which he contributed his most potent performances, Zuskin took on administrative duties as well. These included “painstakingly” putting down the information of applicants on a specific typewriter; without these specific duties and without this particular tool, Zuskin may well have never met his second wife (and the author’s mother) Eda, in 1925. In this way, a lifeless typewriter served as shadchan, or matchmaker, and led to new life. As amply demonstrated by Zuskin Perelman’s book, what remains remarkable about the Moscow State Yiddish Theater, and, later, the Jewish Anti-Fascist Committee (JAC), both of which were headed by Zuskin’s acting partner Solomon Mikhoels, and both of which involved Zuskin (though he contributed to the theater first and foremost), is the ardor of their devoted members. Though the JAC was maintained for the largely functional purpose of creating an apparent contrast between Soviet Russia and Nazi Germany in their treatment of Jews, this propagandistic intention somehow did not mar the resolve or the results of the committee members. The members of the theater created genuinely great works of art; throughout, Zuskin Perelman quotes contemporary critics who saw the touring theatrical productions in which Zuskin performed. These reviews are glowing, and universally so, to the degree that they become a kind of chorus, clarifying and substantiating the worthiness of the book’s focus. And the JAC, largely due to the hard work and sincerity of Mikhoels, attracted huge contributions from around the world, donated with the intention of aiding the struggle against the Nazis. Unfortunately, like one of the inanimate objects that proved so vital to Zuskin’s life, the Jewish Anti-Fascist Committee was seen from a utilitarian perspective by the Soviet government. After World War II had ended, the Soviet government tried and executed its members. With the creation of the Jewish state of Israel, which aligned itself with the United States, and Russia’s long history of anti-Semitism, the Committee was no longer useful. Along with Mikhoels and Zuskin, the JAC included other Jewish cultural luminaries, and for this, the night they were executed has become known as the Night of The Murdered Poets. of being inextricably tied to what is no longer present. art and history comprising the body of an inheritance no less for being intangible. 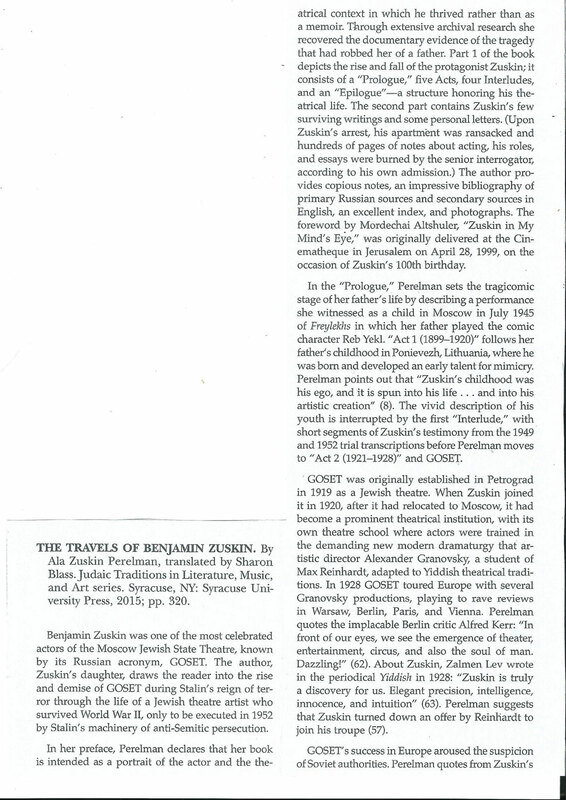 "THE TRAVELS OF BENJAMIN ZUSKIN"
The article by Beate Hein Bennett has been published in Theatre Journal, John Hopkins University Press, June 2016, pp 312-313. I read this book with a growing sense of self-accusation. After all, I have been interested in Hebrew-Israeli theater for many years, and during all that time I ignored the parallel existence of a non-Hebrew Jewish theater that reached some spectacular peaks of artistic achievement. 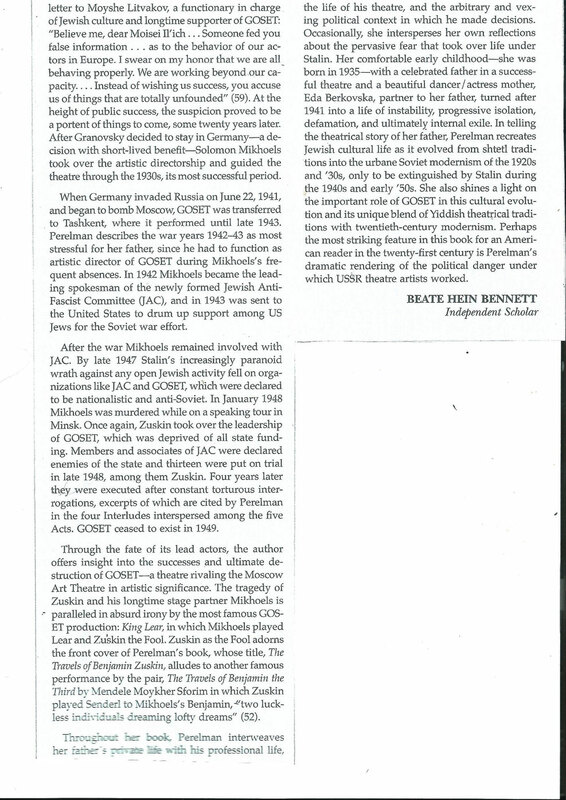 I had heard, of course, of the actor Solomon Mikhoels, who was killed on January 13, 1948, in a "staged" traffic accident (orchestrated by the Stalinist mechanism). But this awareness, which fell under the heading of the Jews' persecution by the communists, did not crystallize into full knowledge of the magnificent and wondrous enterprise that was the Moscow State Jewish Theater, which operated between the years of 1919 and 1949. The accomplishments of the Moscow State Jewish Theater in the 1920s under director Alexei Granovsky were on a pair with those of the Habima theater in the same period, under the direction of Vakhtangov. The European capitals admired both theaters, each with its own distinctive qualities. Marc Chagall, for example, preferred Granovsky's aesthetics, and the murals he painted at the Moscow theater document the company and its era. In the collective Jewish-Israeli memory of those years, however, only Habima has survived, because it spoke Hebrew - although, unlike Habima, the Jewish theater in Moscow had an enthusiastic public that understood Yiddish and loved the theater for speaking in it. The accomplishments of the Moscow State Jewish Theater in the 1920s under director Alexander Granvosky were on a par with those of the Habima theater in the same period, under the direction of Vakhtangov. The European capitals admired both theaters, each with its own distinctive qualities. Marc Chagall, for example, preferred Granovsky's aesthetics, and the murals he painted at the Moscow theater document the company and its era. In the collective Jewish-Israeli memory of those years, however, only Habima has survived, because it spoke Hebrew - although, unlike Habima, the Jewish theater in Moscow had an enthusiastic public that understood Yiddish and loved the theater for speaking in it. Zuskin Perelman first published this book in Russian. The last time she saw her father alive was on December 20, 1948, when she was 12 years old. Her mother (who was Zuskin's second wife) was away from Moscow at the time, on a tour that the authorities forced upon the company even though it was a great budgetary burden to it. Zuskin, then the director of the theater (a role he was forced to take after Mikhoels' death), was supposed to be hospitalized. He had suffered several nervous breakdowns and now, after a prolonged bout of insomnia, was scheduled to undergo an anesthetic treatment at a state clinic. He hugged his daughter good-bye, left - and returned a few minutes later because he had forgotten his slippers. For three days, the hospital reported to the daughter and her aunt that Zuskin's condition was improving. On the night between the 23rd and 24th of December, agents of the secret police came to the house, conducted a search, took some papers and locked the furniture up. At the same time, other agents collected Zuskin from the hospital despite the objections of his doctors. His family never saw him again. His wife and daughter, having learned of the arrest, brought packages and money to the prison, not knowing whether they ever reached him. The Moscow State Jewish Theater was closed, friends and acquaintances were afraid to meet with its staff (although Ala kept going to school as though nothing had happened). In 1953 the mother and daughter were exiled from Moscow. When they were allowed to return [a year and a half later, that is a year after Stalin's death - A. P Z], in 1955 the mother was summoned to the police station, where she was told that her husband has been fully exonerated and that all his rights, as well as the commendations he receive for his service to the revolution as an artist and actor, had been reinstated. At the same time, she also learned that Zuskin had been interrogated in prison for four years and brought to trial (along with 15 other defendants, including authors Peretz Markish and David Bergelson) for treason against the homeland, subversive activity and transporting information to the West. No lawyer had been appointed to defend him, and he was convicted and executed by firing squad in August 1952. The fact that the mother and her daughter knew nothing about the fate of their loved one for five years, and that they learned of his death only three years after it occurred, is not an unusual situation in life under a communist regime. And still, when we learn of this, at the very end of the book, by reading a letter written by the mother, Eda Berkovskaya, to her husband's daughter from his first marriage, it comes as a genuine shock. Perhaps it was right of the author to keep this information concealed until the end. Had she revealed it at the beginning, it would have been difficult to be duly thrilled by the artistic enterprise of Zuskin the actor and of the theater in which he worked. Zuskin Perelman organizes her book like a five-act biographical play, with intermediary scenes in which she quotes from Zuskin's words to his KGB interrogators. This is the compelling story of a gifted man, largely self-taught, who was swept into the world of Yiddish theater and literature by the writings of Sholem Aleichem. He wanted to be an actor, but studied mine engineering instead. When he came to Moscow in the early 1920s, already married and a father, he studied engineering and debated whether to join Habimah or the Moscow State Jewish Theater, established at the same time. He did not consider himself worthy of belonging to both. By chance he happened to visit a friend's room, where a man he did not know asked him if he could type. He said yes and typed up some document for Mikhoels. In his final statements at his trial, on July 11, he said among other things: "I was accepted by chance into the Moscow State Jewish Theater, and this became the tragedy of my life." Zuskin Perelman largely accepts her father's self-perception. It did not prevent him from developing an astonishing career, despite severe doubts. Zuskin Perelman documents all of his roles, most of them played alongside Mikhoels as his vital partner (Sendrel to Benjamin the Third, from the novella by Mendele Mokher Seforim), the witch to Hotsmach, and - perhaps the high point - the fool to Mikhoels' King Lear). Even when a play did not have a role for Zuskin, the director would sometimes create one for him as Mikhoels' silent alter-ego. Descriptions found in the testimonies of spectators - yes, theater does leave behind testimonies of those who have seen it, that's the wonder of it - suggest an actor with a near-mystical ability to fly across the stage (which worked well with Granovksy's distinctly non-realist approach) and at the same time palpable, down-to-earth, Jewish. Mikhoels and Zuskin shared the fraternity and love of partners, but also the rivalry of actors. Zuskin apparently felt that he had to shoulder the burden of the theater while Mikhoels engaged in Soviet and Jewish public activity. He was forced to teach actors (and indeed was a fine, devoted and demanding teacher) as well as run the theater. In 1928, after a theatrical victory tour of the European capitals, the company hoped to perform in the United States as well. The Soviet authorities would not permit it, however, and the company returned to Moscow. Granovsky himself remained in the West. This, really, was the beginning of the end, but the members of the Jewish theater had yet to understand it. There were indications: They were required to represent their Judaism on stage in a critical way and to adapt themselves to the Soviet realism; their Yiddish-speaking audience dwindled, but they continued to enjoy the esteem of the authorities. Zuskin appeared in movies too, and one of them, Seekers of Happiness, became a cult favorite. The opening, written by Zuskin, shows the boat sailing down the river. Zuskin, playing Pinia, askes somedody: "How much could the ship like this cost?" What could be more Jewish on Soviet Union than that kind of question? During World War II (the theater was continuing to operate in Tashkent), the Jewish Antifascist Committee was established, inspired by the Soviet authorities. Its mission was to mobilize world Jewry in support of the USSR as it fought against the fascists. Naturally, Mikhoels was one of the committee's leaders. One day he needed something typed up for the committee, and Zuskin happened to be around. Thus he, too, was recruited into the service of the committee and his name and reputation were put to use, sometimes without his knowledge. By the end of World War II the authorities decided that the Jewish Antifascist Committee had exhausted its purpose. Jewish existence in the Soviet Union, especially after the establishment of the State of Israel (with the support of the USSR), likewise became untenable. However, the committee continued to do its work; so did the theater, even though it had lost its funding. The members of the company were told to sell subscriptions in order to survive, but no Jew in his right mind would buy one, knowing that it could serve as evidence against him. According to the book, Mikhoels knew that he was doomed, and even showed Zuskin a threatening letter he had received. The author was still a child at the time, and her parents tried to shield her from the tension in the air; nevertheless, she reports that her father, too, knew that he was trapped, because to be a Jew in the Soviet Union was to be a nationalist, a punishable crime there. And still he was required to keep the theater running. Ultimately he was arrested and tortured during his interrogations, in which his complex relationship with Mikhoels was exploited to make him incriminate himself. and of being unable to be something else. When asked by his interrogators if he considered himself guilty, Zuskin replied: "partly guilty." His full culpability, as he said himself, was that "I am an actor. I am guilty of focusing exclusively on my work as an actor." and soaked with Russian emotionality. It also has many pictures: Zuskin's photo album survived because he had loaned it to a reporter who promised to write about him before the house was searched. The author is present in the book as a daughter, a child, a scholar. At one point she apologizes to the readers for writing about herself, but at that moment her story is actually entirely reflective of the reality in which she lived: On every birthday, her parents would line up chairs with presents next to her bed, to surprise her when she woke up. A month after Mikhoels' death; she could feel the tension in the air, but still hoped for the familiar celebration on her birthday. On the day she turned 12 she woke up to discover no chairs with presents next to the bed. She sat up, felt around with her feet for her old, worn slippers - and found a new pair. "I like them. And still, for a brief second I feel disappointed. That's it? And in a flash of disillusionment I realize: If on my birthday nothing is as it was, this is a sign that my parents' world has come crashing down, and my own world with it." It is part of Jewish predicament in the It is part of Jewish predicament in the modern world, both before and after establishment of Israel. The private story of Benjamin Zuskin, an actor who succeeded in his art and yet failed in both his art and and his life, is a wondrous tragedy. The book The Travels of Benjamin, by Ala Zuskin Perelman, had its launch on October 6, 2002, as part of the IVth Solomon Mikhoels International Arts Festival held in Moscow. Dr. Irina Goriunova, the Festival Art Director, said that this book's launching was a central point of the Festival. Prof. Vladislav Ivanov, head of the Theater Department at the Arts Research Institute in Moscow, emphasized the book’s international importance. He said that the team of Mikhoels and Zuskin symbolizes not only Jewish culture but human culture as a whole. However, until the appearance of the book, the name of Mikhoels was very well known while that of Benjamin Zuskin went almost unheard. Now the gap is closed. Moreover, said Prof. Ivanov, the author gave each the respect he deserves, in contrast to the common practice of downgrading one artist in relation to the other. Ivanov sees the book as a memorial both to Zuskin and to the Moscow State Jewish Theater. Dr Hillel Kazovsky, an art historian of Hebrew University, emphasized Zuskin’s special place in the history of the Yiddish theater and the book’s special place among others on the topic. Dr Zoya Koppelman of Hebrew University, an expert in comparative research of Hebrew and Russian literature, said she had doubted it was possible to describe theatrical art in plain black-on-white text but as she read the book she felt as if a theater’s colorful stage were before her. In her opinion the author had created an entirely new literary form. Natalia Vovsi-Mikhoels, Mikhoels's daughter, confessed that she had misgivings regarding a lack of personal knowledge on the author’s part, since the author knew her father only in her childhood, but the misgivings proved needless as the author succeeded in exactly portraying the atmosphere in which the two artists worked and in which their families lived. Dr. Marlene Koralov of Moscow, a literary critic and an active member of the organization for memorializing victims of Stalinism, praised the great precision with which the book presents its facts, in contrast to the flood of memorial books that are published without regard for accuracy. The links connecting chapters (the chapters here are called Acts) are transcripts from secret police investigations and courtroom investigations of the actor Benjamin Zuskin. The passages from investigations are woven through the book as transitions, and each of them presents a turning point in the story. The protocols are without commentary, and none is needed since each passage in itself is a tragedy, a comedy, and a drama. Between the dry words of the protocols the life of the actor unfolds — childhood, youth, stage career, tour of Europe, unblemished fame, difficulties during the demise of the theater, arrest, and execution. within the broader drama of life under Stalin. This story is only beginning to be told. With the Cold War and the suffocating effects of official Soviet censorship, people like Benjamin Zuskin were only seen as victims. Yes, it was necessary to mourn their loss but for decades there was little regard or knowledge for what they had represented and achieved for Soviet Jewish culture. Works that are now being produced by a new generation of scholars, inside and outside of Russia, are challenging the myths and misinformation that for so long informed Western understanding of Soviet culture. None of this work is at all an apology for the terrible tragedies and repression that took place. But it does seek to treat individual Soviet personalities and the institutions they worked for as fully human, as sympathetic, at times even heroic under conditions that Western cultural figures can only begin to imagine. exemplifies this newly emerging literature. It has even been said that she created an entirely new literary form. And about the hero, Benjamin Zuskin, “just” an actor and “just” a modest and charming man, was said that he happened to personify the principal traits of his epoch, his art, and his people. I have no words. I read your book with great attention, and I wanted to tell you what a great work you have produced. As a theater scholar, I find an incredible amount of historical information in it, but there is also your deep personal involvement in the story. And you are able to tell it with a delicate sensitivity, with a sure literary wisdom. It is something unique, a story, an essay, an epic, a tragedy, and a comedy, and a history. Benjamin Zuskin. He seemed to be overlaid with a huge shadow of Solomon Mikhoels, head of the legendary Moscow State Jewish Theater. Zuskin’s daughter, Ala Zuskin Perelman, undertook the mission of telling about her father. The truth has to be said – when I opened her book, Travels of Benjamin: Thoughts about the Life, the Art and the Destiny of the Jewish Actor Benjamin Zuskin (Jerusalem-Moscow 2002) – I was skeptical. I thought that there was nothing to expect from a daughter’s recollections supposedly retelling other similar memoirs. I have read a lot of works of such a “daughter-made” or “son-made” apologetic genre. I was absolutely wrong. and the poignant sensitivity of the daughter. Today the subject or the Yiddish theater has become popular in academic studies. Without this book, no study of the subject can make headway. Benjamin Zuskin was born in 1899 in Ponievezh, Lithuania… In 1920 he moved to Moscow… In Moscow, completely by chance, he met Mikhoels, and in 1921 became actor in the new Jewish theater where people having some previous experience in an old-fashioned Yiddish acting, were not accepted. On the Jewish stage, his talent made him even to prevail in the tedious Soviet plays, and this was not an easy task in a Soviet theater. As rewards for his work he received an apartment in the center of Moscow, an order and other badges and awards, and honorary titles. Between the latter, there was title of a member in the Jewish Anti-Fascist Committee. For this one, he was sent to the prison – straight from hospital, sleeping, since he had been cured with anesthesia. The doctors in their naïveté, did believe that they could cure that hopelessly incurable crisis. Benjamin Zuskin, a famous actor in The Moscow State Yiddish Theater, used to tell the stories of his life to his younger daughter Ala. After many years, Ala has introduced these stories into the book that she has written about her father – first in Russian, afterwards in Hebrew, and now her book is published in English. The poet Osip Mandelstam was watching the productions of this theater company in Kiev in 1926. He had a sensation that in its acting there was “an inner plastic of the ghetto” (which is quoted in the book), surely not in our nowadays tragic connotation. Mandelstam had in mind the plastic of gests and motions as an expression of the Yiddishkeit which the theater was showing on its stage. Zuskin’s best roles were in the productions based upon the works by extremely “plastic” Yiddish classics, such as Mendeli Moykher Sforim and Sholem Aleichem. In Zuskin’s eyes the pinnacle of his theatrical achievements was Senderl in The Travels of Benjamin the Third by Mendeli Moykher Sforim. since even though Ala Zuskin Perelman is recounting her father’s biography in a chronological order, year after year, this order is wedged in with a few chapters comprising materials of the trial and the fore-run investigations in Lubyanka prison where Zuskin and other Jewish artists were imprisoned during almost four agonizing years. The Travels of Benjamin Zuskin gives readers a full account of the life and career of an artist who was instrumental in advancing Jewish theatre and culture, but whose name may be less known to the general public. The readers feel like first-person witnesses to the events described in the book. The book is an excellent source for anyone interested in theater, Jewish theater and culture, Russian history, and life in general.